The latest in Big Finish’s Early Adventures range, Philip Lawrence’s The Fifth Traveller begins in medias res, with the Doctor and his companions being chased through an alien city by some rather narked-off soldiers. It’s an unconventionally active beginning for a First Doctor story, albeit one that gives way to a more traditional set-up once the Doctor, Ian, Barbara, Vicki and Jospa, having escaped in the TARDIS, land on the jungle planet of the Arunde. What we have from this point onwards is, in large part, a good attempt to mimic First Doctor alien planet stories like The Web Planet and The Savages, with the team splitting up, exploring the jungle, and dealing with obstacles. 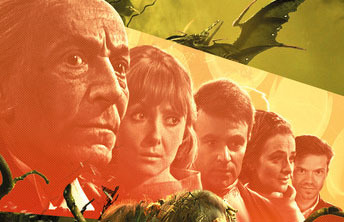 There’s also a sub-plot about a device which will potentially give the Doctor control of the TARDIS’s destinations, which allows for an interesting exploration of his companions – Ian and Barbara would love to return home, which upsets the orphaned Vicki, who sees her fellow travellers as the only family she has. There’s some nice bonding between her and Jospa, who (as we all know) is an orphan too and so can emphathise with her. This character dynamic allows our heroes’ story to feel well paced, which makes it a shame when the story cuts away to the ape-like Arunde; their story is a rather typical power struggle, and given that it takes until part three for any of them to properly meet any of the travellers, does drag on a bit. Of course, there is another element at play – you may have guessed from the title and the new companion being treated as if he’s been around for a while that something’s up with this Jospa character. Needless to say, the truth behind the fifth traveller is revealed over the course of the story – we won’t spoil the twists, but it’s a mystery that Lawrence weaves neatly into the plot.